Get your white SONOS PLAY:5 off the counter and onto a stand designed specifically for it. Here are a few reasons why a stand will make your life easier, and your black PLAY:5 more useful. Using a stand with your awesome PLAY:5 speaker means you can put it anywhere in the room. Get the best sound quality no matter how you are using your speaker. With its unique design, the SONOS PLAY:5 can be set up horizontally or vertically. This stand supports both orientations so you can set it up whichever way is best for you. Plan on using your PLAY:5 on hardwood or carpet? No problem. We include carpet spikes and rubber pads to keep your stand stable on any surface. Don't worry about cables cramping your style. Hidden wire channels give the stand a seamless, cord-free look. Keeping the cables secure and out of the way reduces the chance of your dog accidentally knocking your speaker stand over. 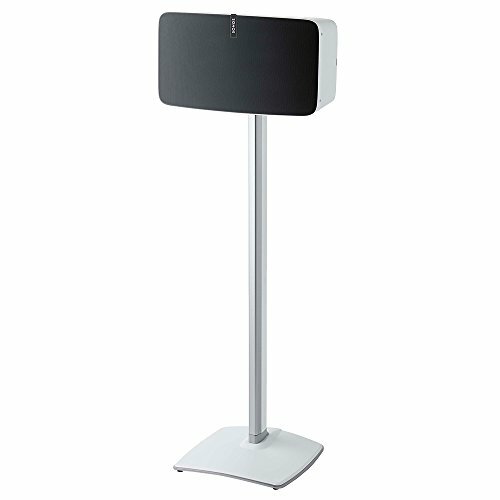 Built from high-end anodized aluminum, our stand is durable and looks great while hiding the cords. Maximize the full sound your SONOS PLAY:5 produces by using a Sanus stand. We built it to be at the optimal height for accurate sound dispersion. How do we know the optimal height? SONOS told us. Not a bad source. If you just set your speaker on an end table you'll lose some sound quality. Using a stand with your PLAY:5 secures the speaker for optimum bass response. To get the best sound quality from your sweet PLAY:5, get a speaker stand. When you get your SONOS accessories from us, not only do you get a high-quality product made specifically for SONOS but also access to our US-based customer service team. They're available 7 days a week to answer your questions or help with assembly. Although, you probably won't need it because our stand is made to be assembled in under 15 minutes with only a screwdriver. If you have any questions about this product by Sanus, contact us by completing and submitting the form below. If you are looking for a specif part number, please include it with your message.